Innovative Complex Systems (ICS) has developed a drone to fight parasite butterflies at agricultural fields and in forests using wasp larvae, Trichogramma. It is an organic alternative to chemical protection that is destructive to the environment. The startup is currently signing a deal on field treatment with French canned food producer, Bonduelle. Earlier, ICS worked on an order from the Russian Agricultural Center of the Belgorod Region, ICS regional representative Maxim Vasilyev told Invest Foresight. Innovative Complex Systems (ICS) was established in 2016 in St. Petersburg and is owned by Elvira Lesnichaya (according to Kontur.Focus service). The company was created after Ukrainian unmanned aircraft destroying parasites at agricultural fields with benign insects were banned from Russia. The business idea was suggested by the Russian Agricultural Center which studies plant protection means, among other. For two years, ICS used convertiplanes that can cover 10 ha per hour. Then it developed an unmanned aircraft, a hybrid of a quadcopter and a plane but with a capacity of up to 50 ha per hour. The new machine weighs around 4.5 kg and is almost twice as light as a regular drone (8-10 kg) and also faster (50-60 kmph). This drone can lift up to 1 kg. It is fully automatic and controlled by flight software. To treat one hectare of land for large fields would cost 200 rubles, which is twice as cheap as piloted aircraft (RUR 360-400 per hectare). At this rate, any farmer could use the machine to protect its fields thus creating prospects for ICS business growth. The drone itself will cost RUR 420K but none are available for sale yet as the testing and improvement continue. The drone developed by Innovative Complex Systems allows reducing the prime cost of introducing entomophages (beneficial insects) and achieving high accuracy. A drone flies by coordinates at the altitude of up to five meters and follows the terrain, so there is no risk for insect eggs to be blown off or carried out into the atmosphere by ascending air mass. The efforts have already resulted in manufacturing several dozen drones. The company has not provided the exact number of unmanned vehicles to be produced annually. Today, about 5,000-6,000 such agricultural drones are manufactured across the globe. Innovative Complex Systems would like to produce 10% of the current market supply. A drone diffuses Trichogramma eggs. Within two or three days, eggs hatch into small larvae and get inside and lay their eggs, killing the butterfly parasites. The wasp efficiency is 70-80%, a good indicator as compared to chemical protection agents, to which parasite quickly adapt. Also, chemical agents are hazardous for the environment and human health. The use of the drone prevents the destruction of crops plants, corn, peas, apple trees, wheat and forests by butterflies and caterpillars, and they grow well. “We help preserve the environment and restore organic farming traditions,” Maxim Vasilyev says. Larvae are purchased from the Russian Agricultural Center. The labs that raise these beneficial insects are located in St. Petersburg and Krasnodar. Maxim Vasilyev is thinking about launching a biofactory to produce Trichogramma, which could allow processing fields at a lower price than their competitors. In the Soviet Union, this method was used since the 1930s until the chemization era, resulting in a total of 18 mio hectares of Trichogramma-process fields in the 1970s. Today, the area is only 200,000 hectares. 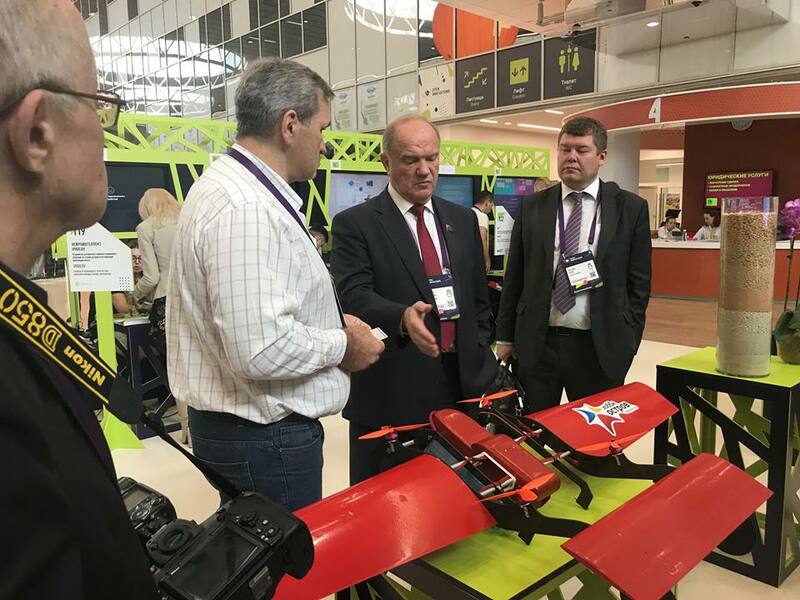 This summer, Hobby Ostrov dispensed biological treatment on 1,500 ha in the Belgorod Region for Russian Agricultural Center using these drones. The company’s further plans include treatment of Bonduelle pea fields in the Krasnodar Territory. New drones will also be supplied to Uzbekistan, Tajikistan, Kyrgyzstan and Kazakhstan to protect cotton fields. Uzbekistan has had effective biolabs for growing Trichogramma since Soviet times; there have been in. Innovative Complex Systems is going to press Chinese drones, as its devices are less expensive and more efficient. Next year, the company has forest protection plans in the Vladimir Region with the Russian Research Institute of Silviculture and Mechanization of Forestry. An area of 3,000 ha will be treated to suppress pests such as the Pine Sawfly. The forest needs to be treated several times during the season because insects produce offspring repeatedly. Greenhouse farms also approach the company for solutions to get rid of the red spider mite. Drones cannot operate in a greenhouse; therefore they came up with another solution – a manipulator arm that can distribute insects that naturally neutralize the red spider mite on the leaves of the plants.